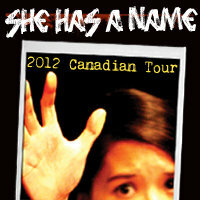 Inspired by an event in April of 2008 in which an abandoned storage container was found in Thailand containing 121 workers from Burma, 54 of them dead, Andrew Kooman’s She Has A Name dramatically gives human trafficking a face. Tickets: $27; available online and at the door. A talkback session with panelists Aura Burditt (Chair, London Anti Human Trafficking Coalition) and Marty Van Doren (Human Trafficking Awareness Coordinator, RCMP “O” Division) will immediately follow the show.